The 70 year desolation of Jerusalem isn't the only Bible prophecy that failed according to the 587 chronology. 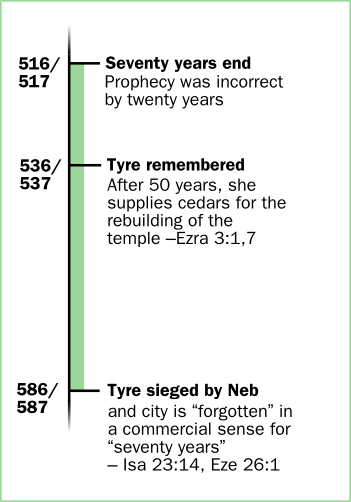 There is another 70-year Bible prophecy that also supposedly failed – for Judah's enemy, Tyre. ), and secular chronology agrees with this point, then Babylon attacked Tyre in late 607 or early 606 BCE. 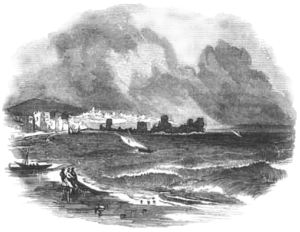 The 70 years for Tyre began after Jerusalem was destroyed. For 70 years Tyre was not hired in a commercial sense. 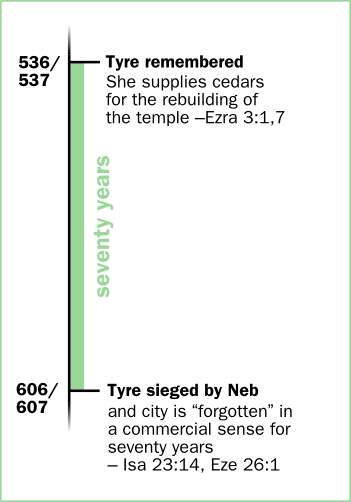 The period ended when Tyre supplied Cedars for the Temple of Jehovah, exactly 70 years later. Only the 607-based chronology allows for this period. The secular chronology does not.